I believe life is about the journey. It’s a celebration of trials and triumphs, alone or with friends. It can be solo or intimate and sometimes even immersed in large social experiences. It’s something special and should be treated accordingly. Kristian Regale makes life a celebration. We’ve all tried the sparkling apple cider. My kiddos love it and it has long been a tradition for birthdays and New Year’s Eve. 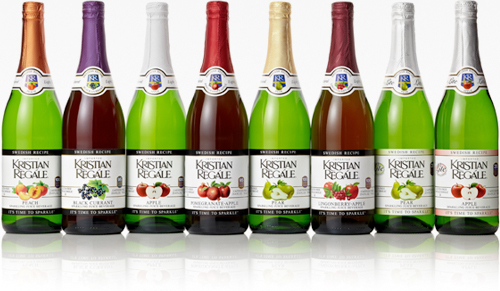 Kristian Regale takes that apple and transforms it into a variety of flavors making the experience one to remember! With eight amazing flavors of non-alcoholic sparkling juices, including the traditional apple, pear, pomegranate-apple, peach and more exotic flavors like black currant and lingonberry there’s always something to celebrate! The Sparkling Juices use only the finest, natural ingredients. I love the label because every bottle has so few ingredients. Inside the beautiful bottle you’ll find ingredients like Geranium Botanicals, Natural Fruit Juice, two thirds LESS sugar, no preservatives and no alcohol or Caffeine! It’s a celebration that is good all around. Kristian Regale is perfect for young and old. I love being able to do special things with my children and this beverage is fun, it’s refreshing, yet not overly sweet. The bubbling juice is perfect for entertaining or just relaxing with the husband while watching our favorite television show. This is the perfect accessory to any moment. The flavors are delicious and light and they can be shared with anyone, including children. Pick up a bottle or case today and celebrate the small and big things in life…everyday. Hi there my sister has her 21st this year but i am looking for something special for her like have her picture on the bottles.do you do this? ?